Onychomycosis—or toenail fungus, as it is more commonly known—is an infection of the nail with dermatophytic fungi, associated with athlete’s foot (tinea pedis). The onset is often slow and asymptomatic. The infection will most commonly be found in the big toe (hallux), but in some cases all ten toes may be affected. Fortunately, laser treatment for toenail fungus is often effective. Fungal infections in the nails are typically caused by a group of fungi called dermatophytes, although yeasts and molds can also cause toenail fungus. A person can contract toenail fungus by using shared showers, or in locker rooms, gyms, and other warm, damp places, including home showers that are shared by multiple family members. Dermatophytic fungi live in warm, moist environments like showers, bathrooms, swimming pools, shared showers (i.e., dorm room showers) and gym locker rooms. It is estimated that 10–12 percent of the adult population is affected worldwide. Older people have a higher rate of onychomycosis, with an estimated 20 percent of the population aged 60+ and 50 percent of people aged 70+. Onychomycosis is present in approximately one third of people with diabetes mellitus. It is a significant predictor of foot ulcers, and can be clinically serious. Laser treatment for toenail fungus will take your doctor approximately twenty minutes to perform. The treatment is very tolerable, requiring no anesthesia or numbing agent, and there is no downtime following the procedure. Laser treatment for toenail fungus is a safe and effective procedure that does not require a lifestyle change or regular blood tests to monitor liver function. Unlike oral medications, laser therapy is targeted directly at the infection. 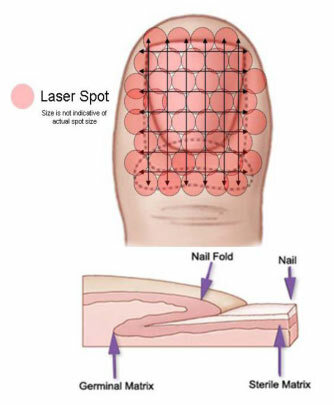 Unlike topical treatments, laser therapy is able to penetrate the nail plate to get to the fungus. After three to six months a healthy nail grows out. Laser therapy works in a similar manner to how your body fights off an infection. If you become sick, your body develops a fever in order to raise your temperature to fight the viral infection. The same principle is used to treat toenail fungus with a laser. The laser is directed at the nail to heat it up until the fungal spores are killed. This allows a new nail to grow out fungus-free. Fungal laser treatment is done in an office setting. Your nail polish will be removed, if you are wearing any. A temperature probe on the device will measure the temperature of the skin and nail. Each nail needs to reach a certain temperature to properly treat the fungal infection. If the heat becomes too painful, your doctor will move on to the next nail. You will be able to walk in and walk out the same day, with minimal pain from the procedure. There is no need for any injections or anesthesia, as most people can handle the procedure quite well. The treatment takes only about twenty minutes. Topical antifungal creams may be prescribed for any skin infection, and you may be given instructions for shoe sterilization. You can put on nail polish after only twenty-four hours. You will be seen again by your doctor within four to six weeks for another treatment. Keep in mind that the nail grows slowly, and it may be over three months before you see results.